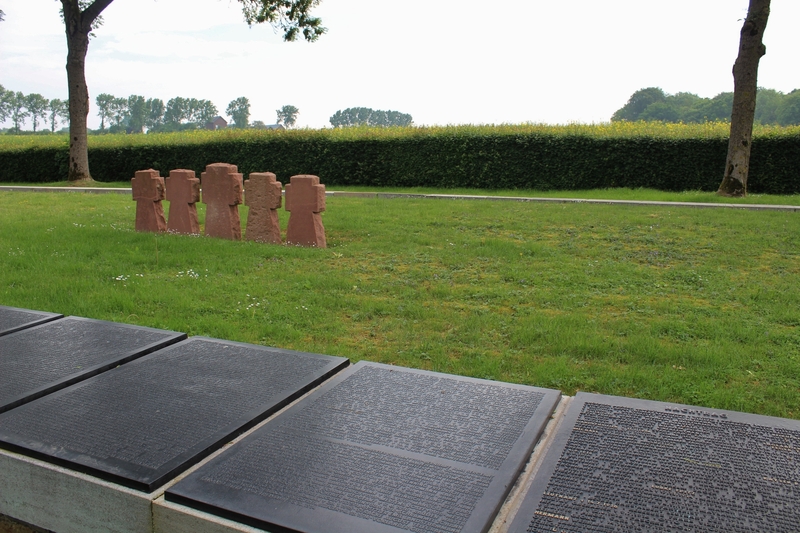 The village of Fricourt was a heavily fortified section of the German front line defenses prior to the Battle of the Somme in July 1916. 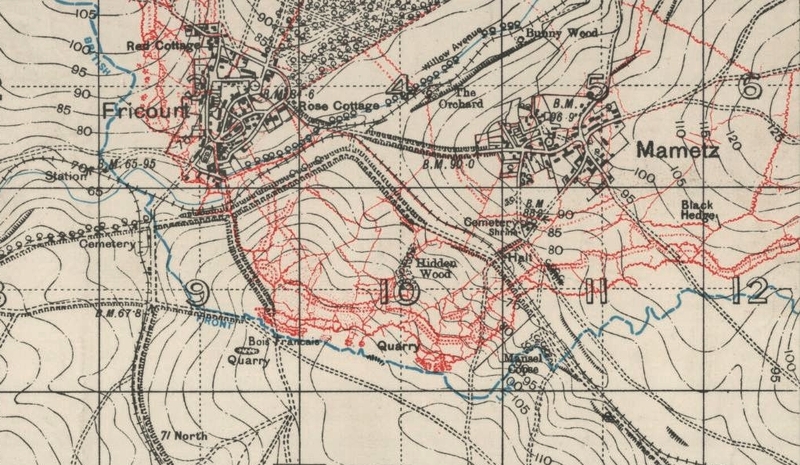 Despite the Germans spending many months incorporating the cellars of the battered buildings of the twin villages of Fricourt & Mametz into their defenses (as the map above, from late April 1916, shows), reinforcing and connecting the cellars and constructing concrete bunkers to cover the approaches from the west and south, both villages were successfully captured by the British by the second day of the battle. 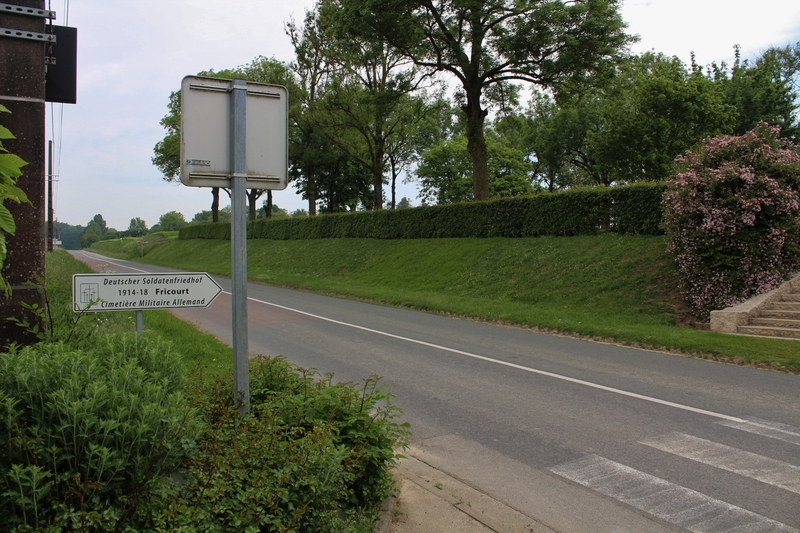 Just north of Fricourt, on the road to Contalmaison and Pozières, and a short distance off the trench map, a sign points us to one of only a very small number of German cemeteries, compared to the more than 400 British, to be found on the Somme. 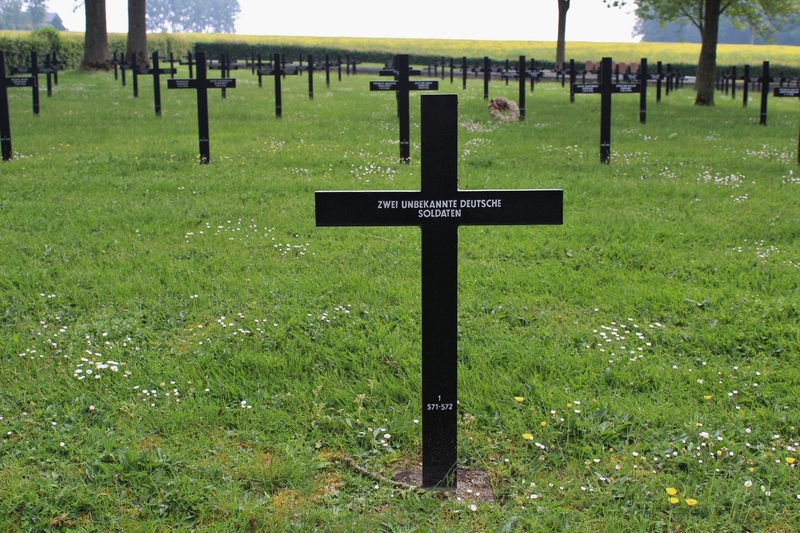 …the black crosses stretch away into the distance, marking the remains of over 17,000 German soldiers killed on the Somme battlefields between the autumn of 1914 and the summer of 1918 if you include the 11,970 who are interred in four mass graves at the far, eastern, end of the cemetery. 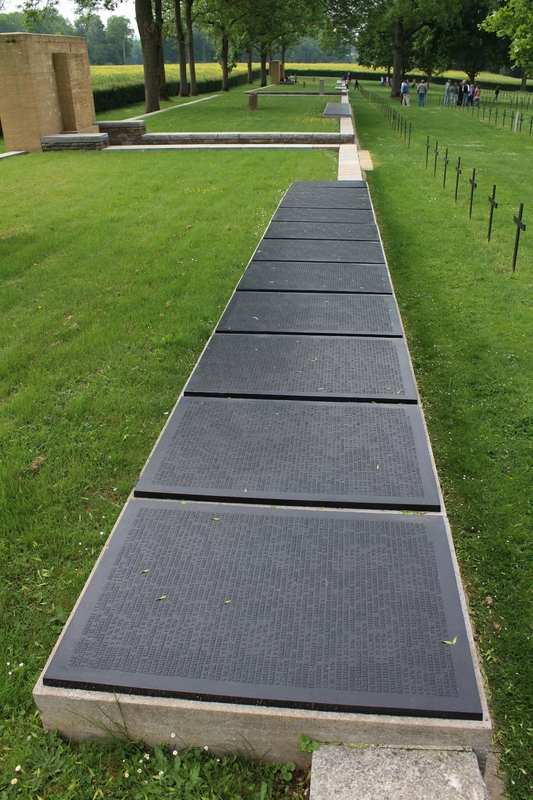 5,057 men are buried in individual graves, although unlike British or French military cemeteries, the majority of the metal crosses record the names of four soldiers, two names on each side. 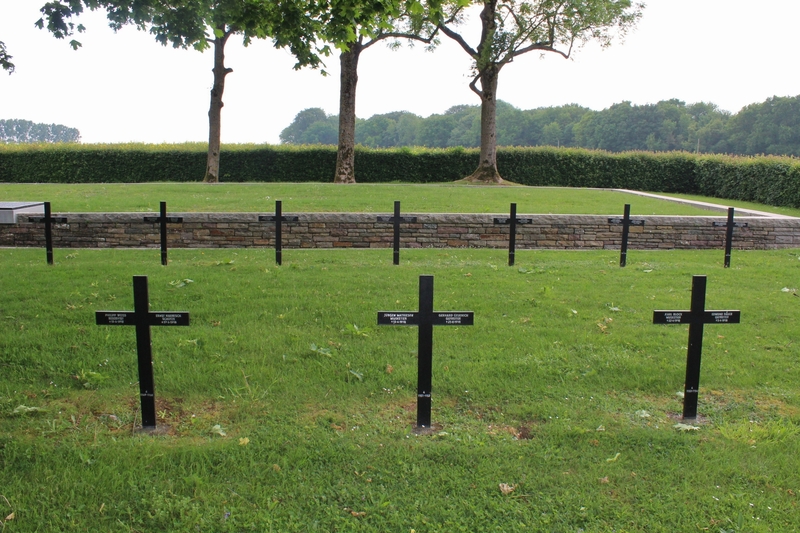 I’m sure that many people who visit assume there are four men per grave, but this is not the case – there is one cross per four graves. Usually. 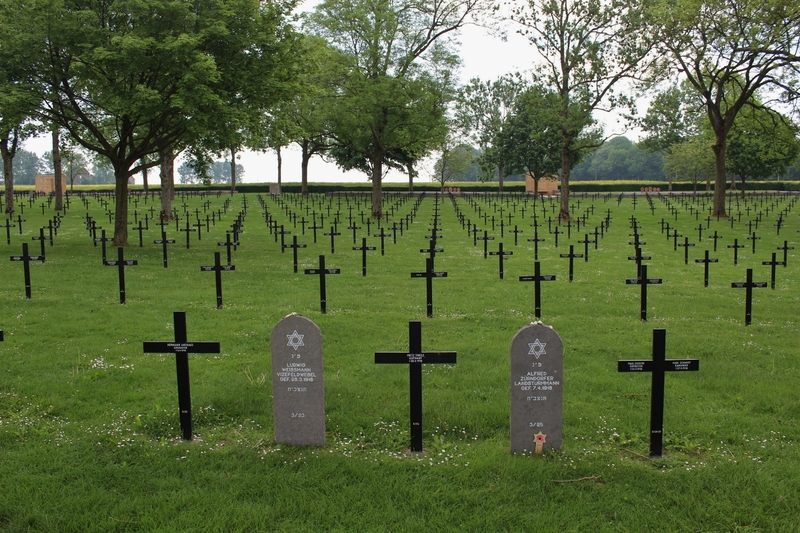 Because some crosses have just one name on each side (above left), and there are fourteen single Jewish burials, all marked with stone headstones, scattered across the cemetery. 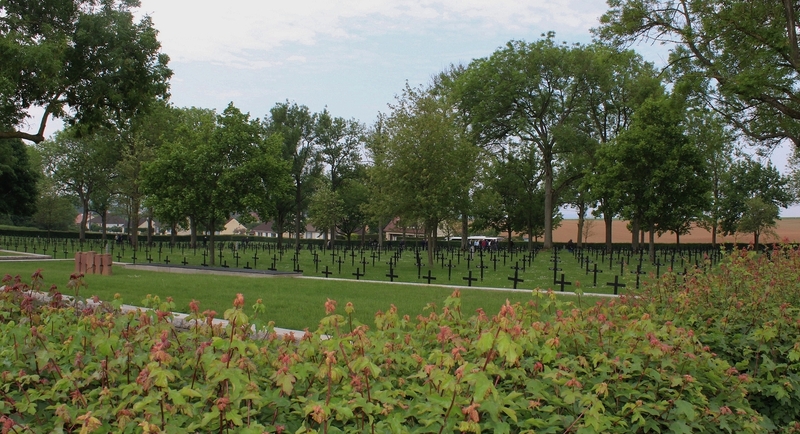 View from the north west corner looking south east, diagonally across the cemetery. 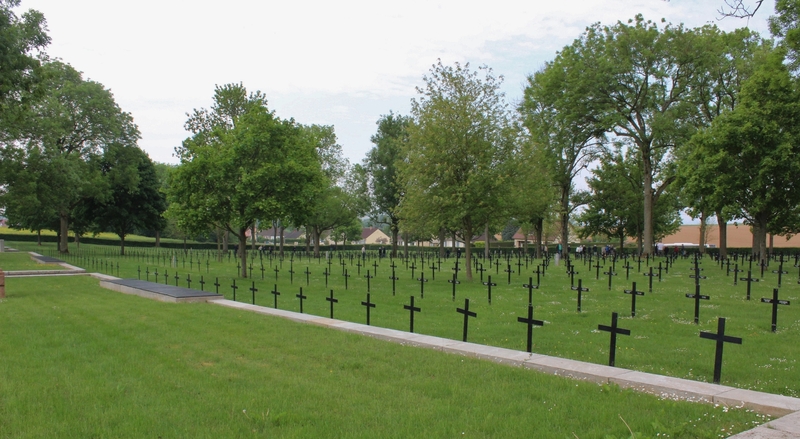 …two identified artillerymen killed on 29th March 1918. 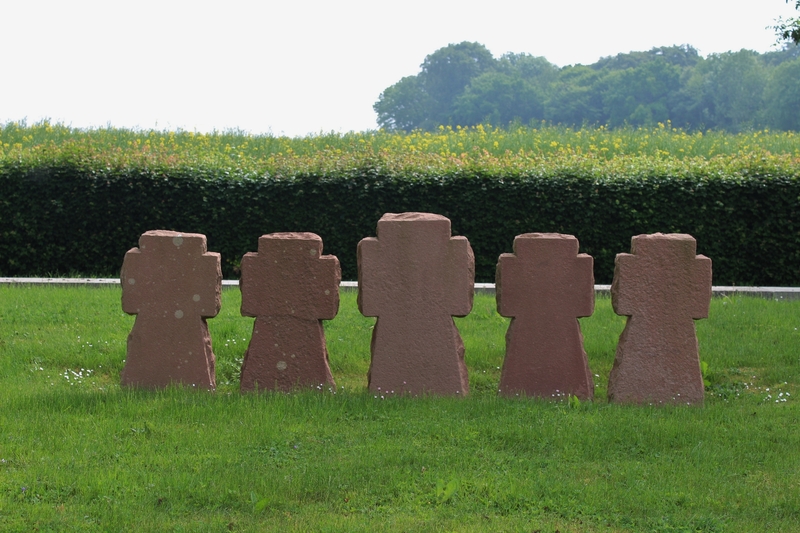 I think it may well be a simple case of aesthetics, because the stone tablets are to be found between the rows of crosses, and perhaps the cemetery designer felt that the occasional single cross placed between the rows would look unsightly. 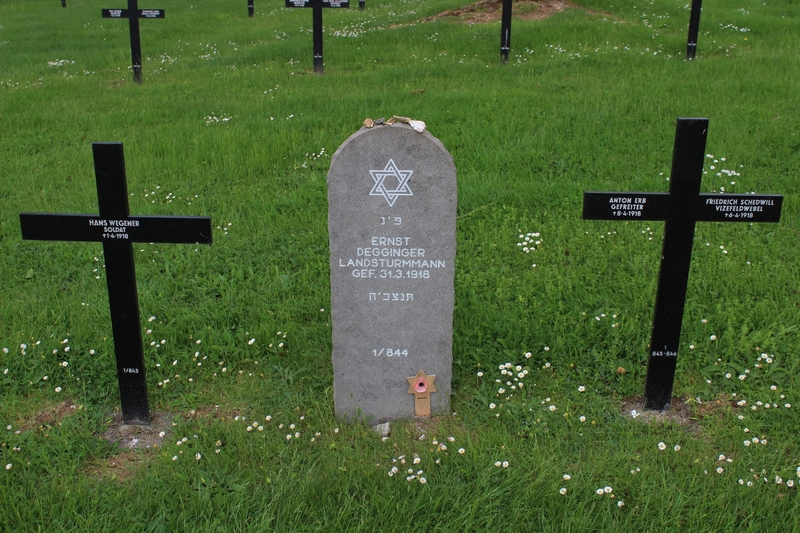 …a tattered wreath and another tablet, this one remembering two identified unteroffiziers, both killed in August 1916. 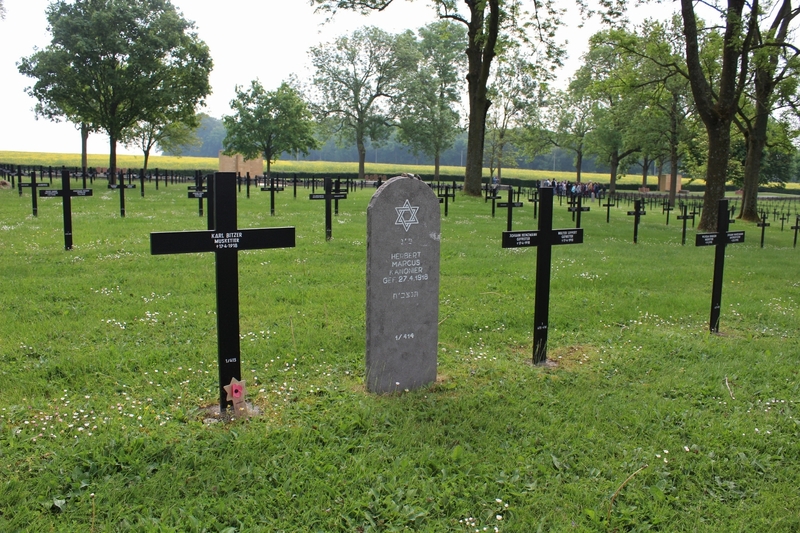 Another of the Jewish burials alongside another cross with just a single name on either side. 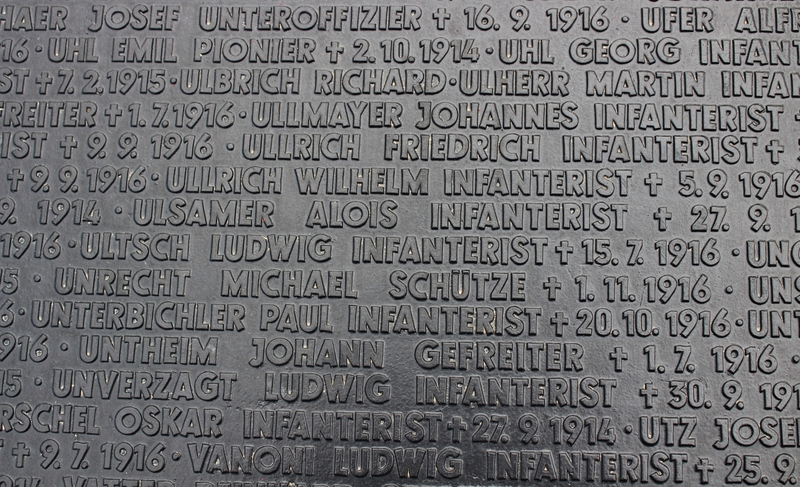 A third stone tablet remembers one known and two unknown soldiers; note the sparsity of information given on the crosses behind. 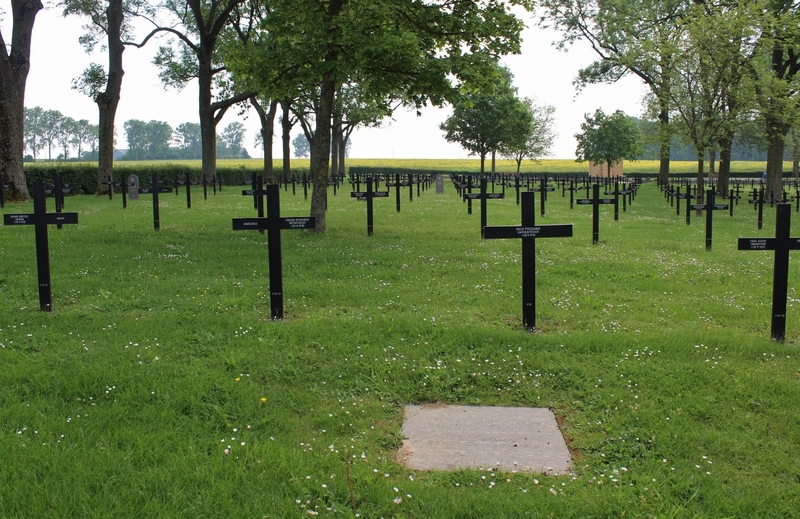 This shot, looking south west across the cemetery, shows the reverse of the crosses, all those visible in this photo with two more names on this side – you’d be surprised how usually excellent resources maintain that there are two names on the crosses in German military cemeteries, forgetting that names are usually to be found on both sides. 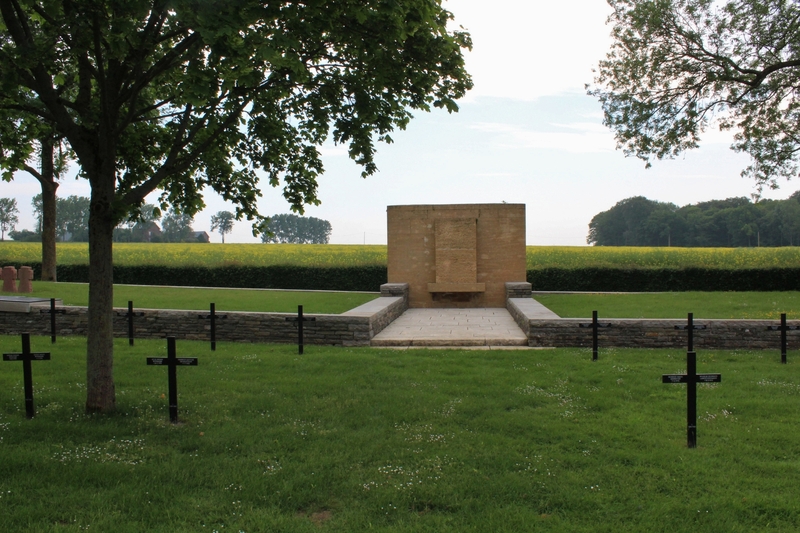 Some 10,000 of the men buried in the cemetery were killed during the Battle of the Somme between July & mid-November 1916, and another 6,000 during the battles on the Somme in 1918; the rest died as a result of the day-to-day warfare that never ceased along the whole Somme front. 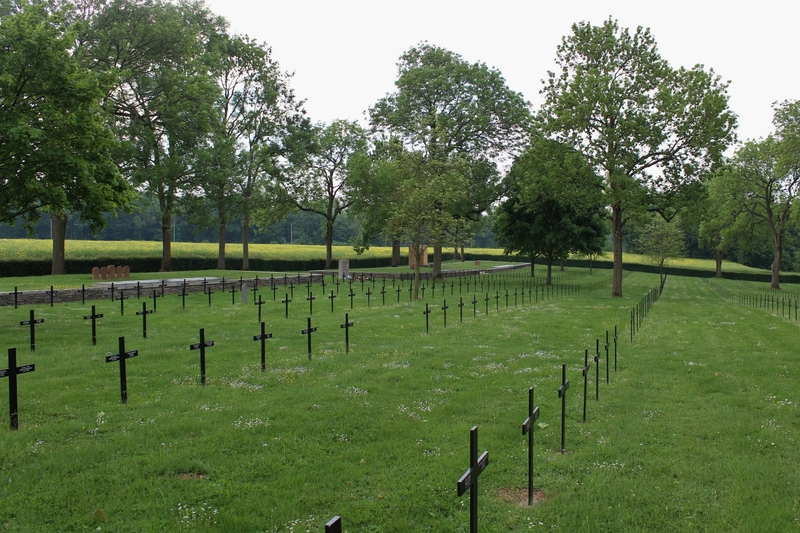 Panning to our left; the mass graves can be seen along the eastern boundary. 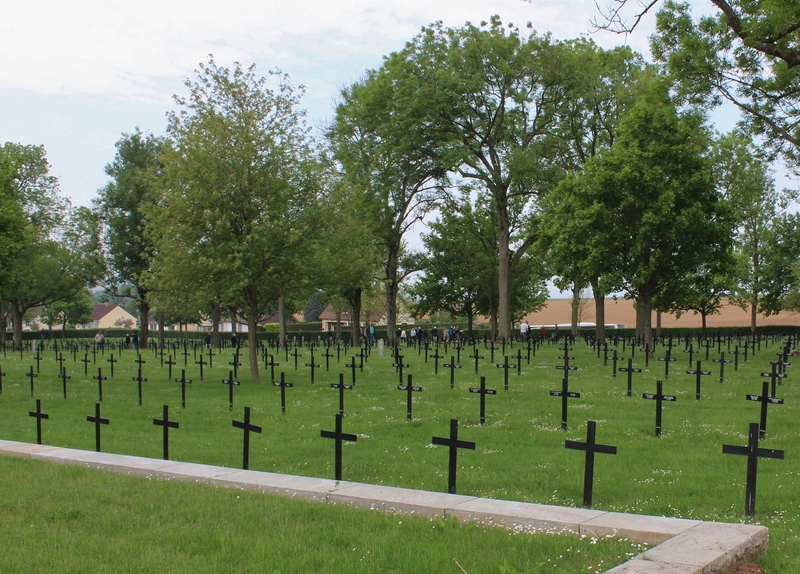 I previously said that ‘names are usually to be found on both sides’, usually being the operative word because, as you can see, the crosses in the final row, due to their proximity to the mass grave in the foreground, are all blank on the side nearest the camera. 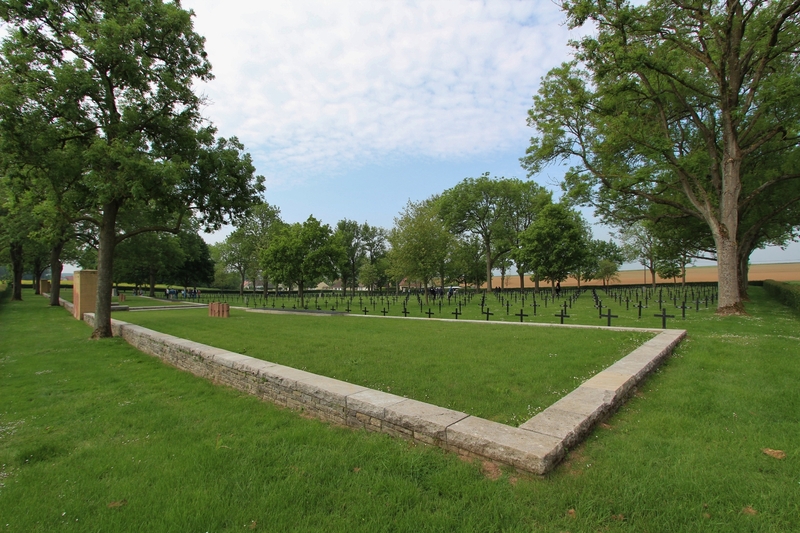 …the four mass graves, containing nearly 12,000 casualties, stretching the width of the cemetery. 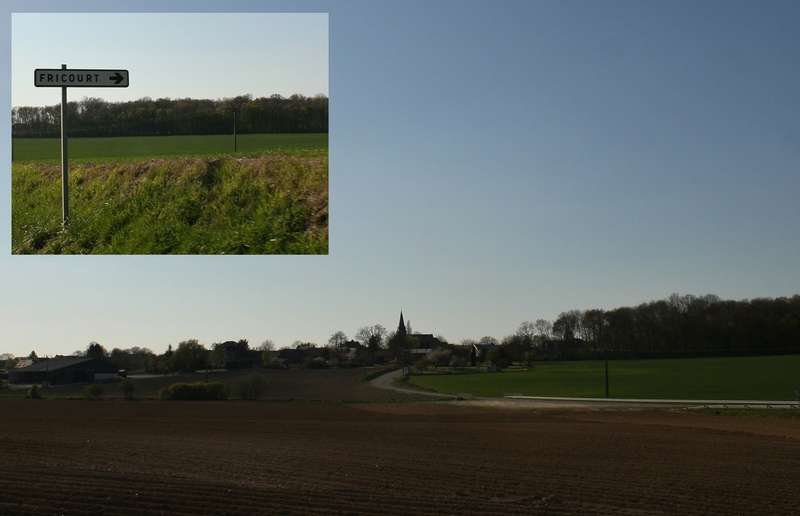 View looking south west from the cemetery’s north eastern corner. 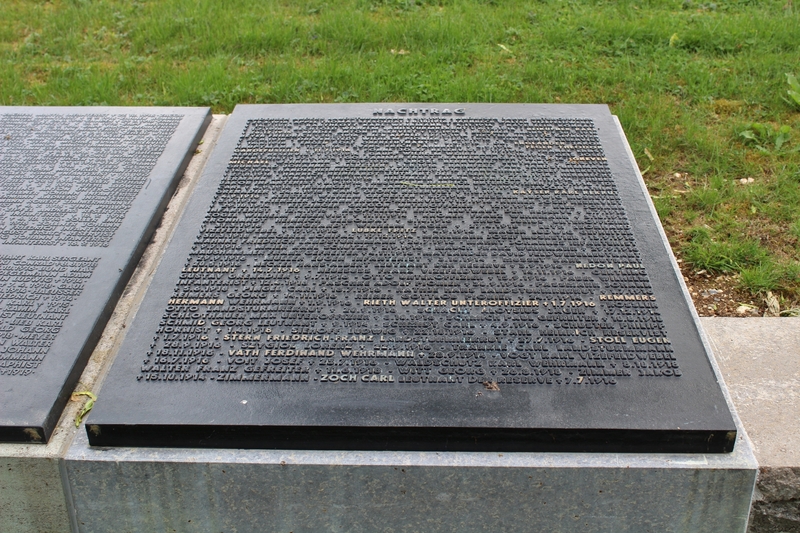 …while bronze tablets at the front record the names of those who are known to be buried within. 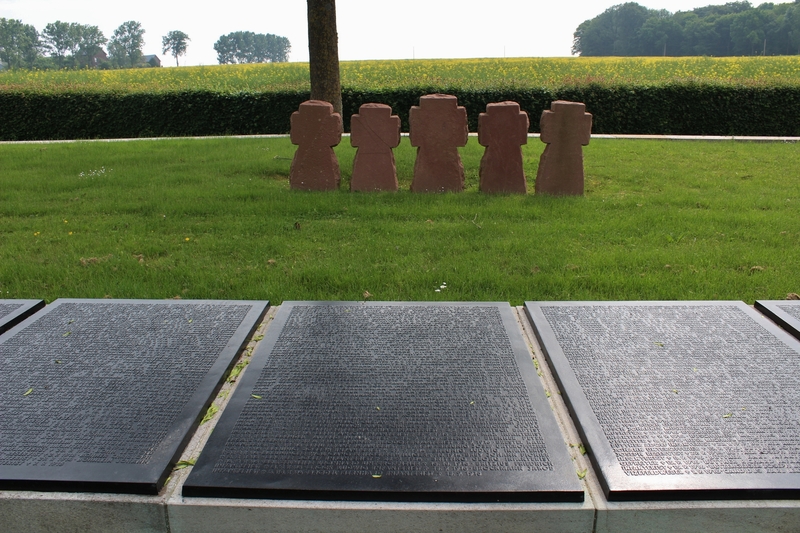 The names of just under 6,500 of the men buried in the mass graves are unknown. Looking roughly west down the length of the cemetery. 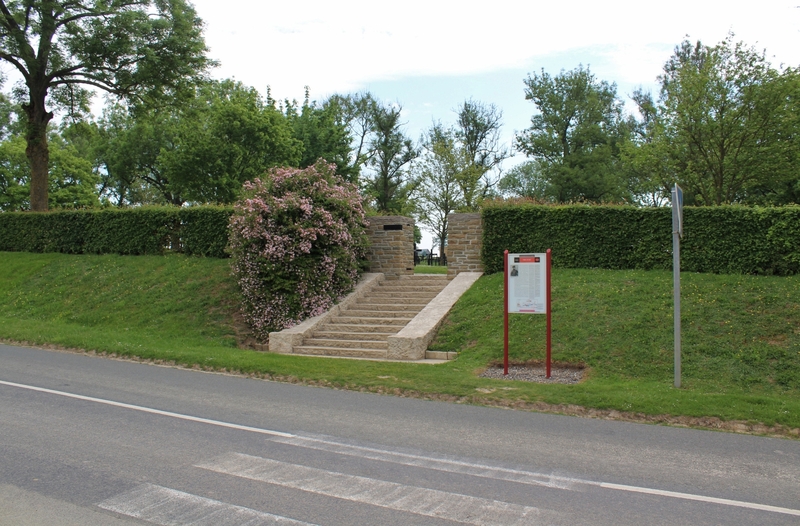 Unlike British military cemeteries, which have a timeless quality about them down the years, had you visited Fricourt fifty years ago things would have looked very different from today. 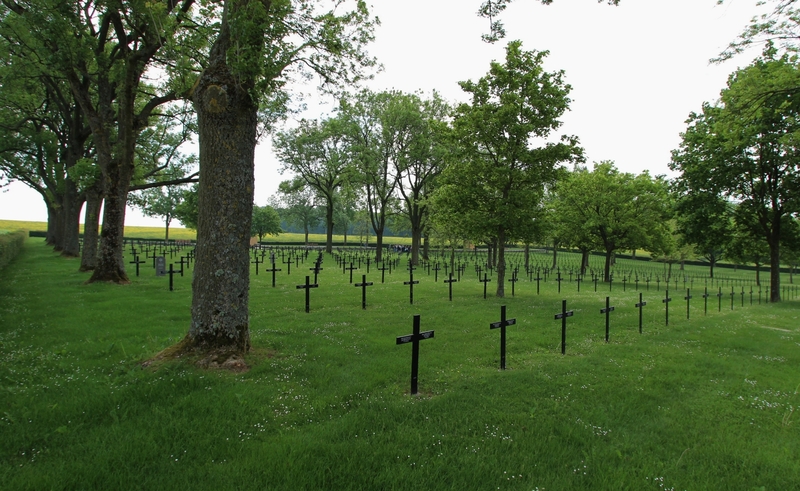 As the Somme battlefields were cleared in 1919, the French authorities designated certain sites for the burial of the German dead. 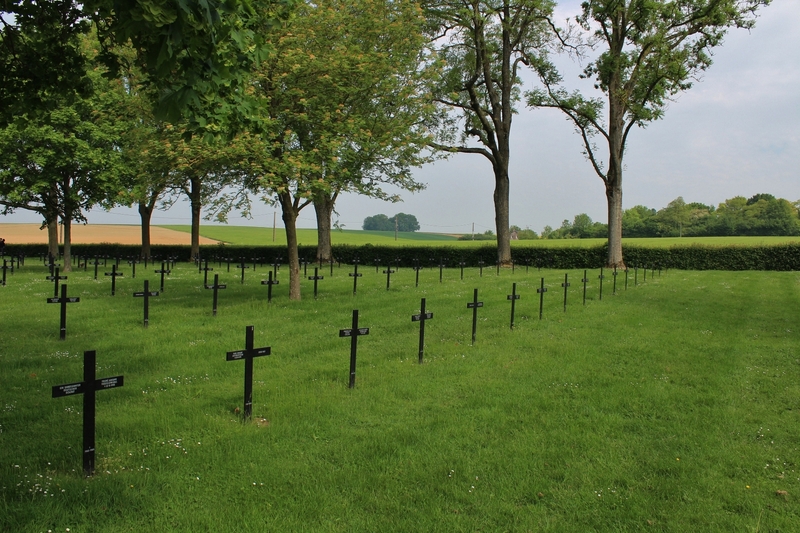 Most sources maintain that Fricourt German Cemetery was begun in 1920, but that leaves the question of what they, or rather the men of the British Labour Corps and others tasked with clearing the Somme battlefields, did with the German bodies in the meantime; more likely the first burials were made at the cemetery in 1919, I would have thought. 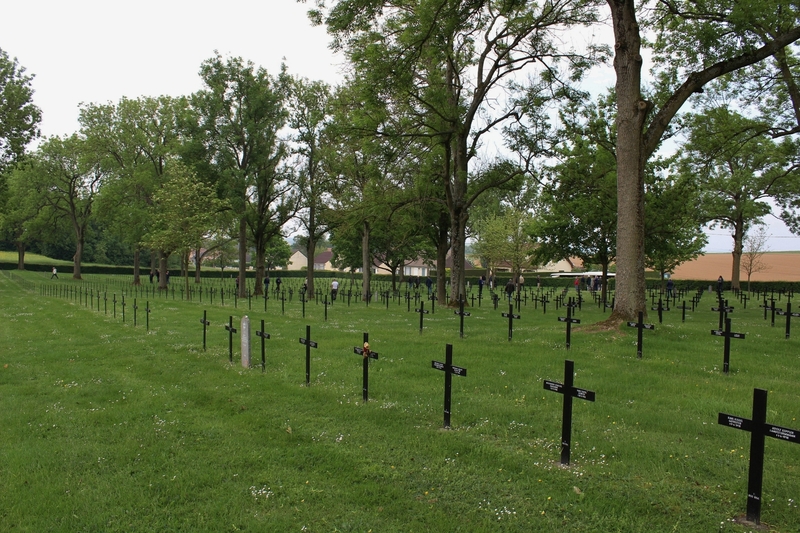 Whatever, bodies were brought in from seventy nine German burial grounds, large and small, on the Somme, including the areas around Albert, Bapaume, Combles, the Ancre valley and Villers-Bretonneux. 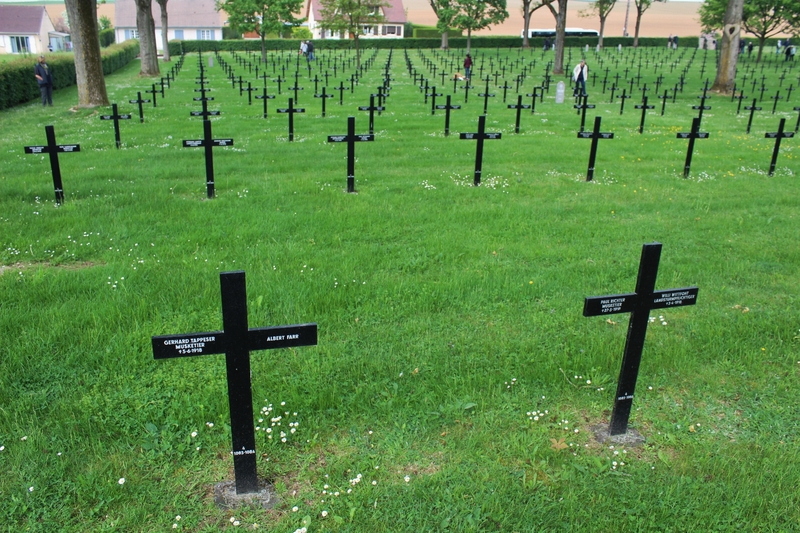 By the end of 1920 some 10,000 bodies had been buried, or reburied, here, and over the next six years 6,000 more would be added. 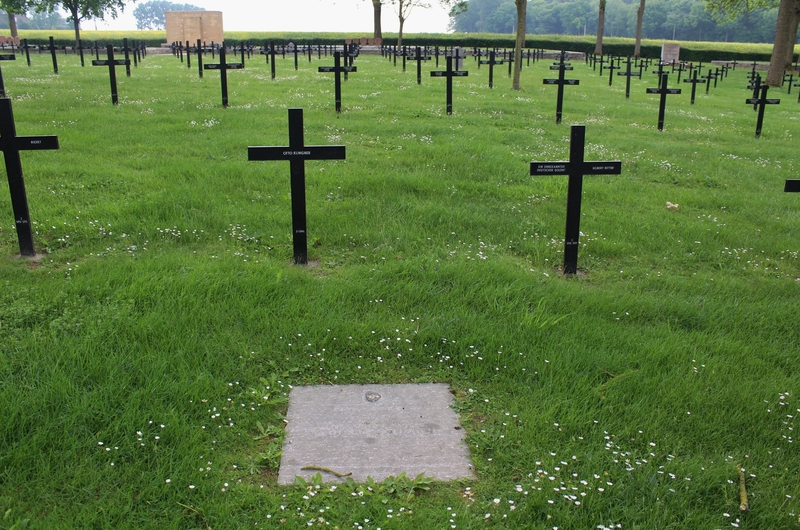 In 1927 the French authorities finally allowed the German equivalent of the CWGC, the Volksbund Deutsche Gräberfürsorge e.V. 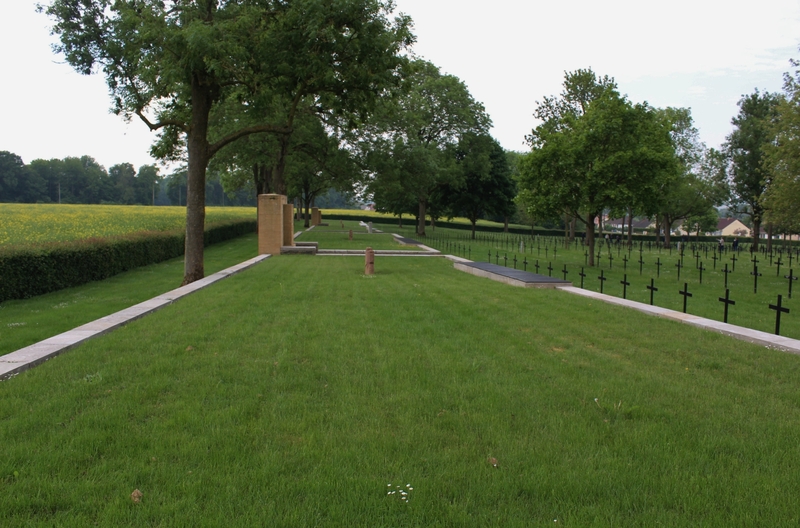 (VDK), to take over the running (and the cost) of the German military cemeteries in France, and for the next two years no further burials were added, as the architectural design and landscaping of the cemetery were begun, after which it seems a further 1,000 men were brought here for burial over the next few months. 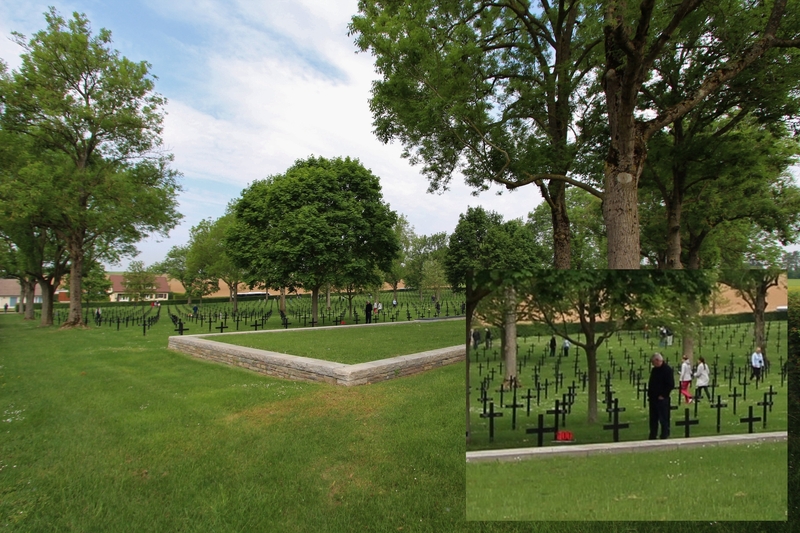 The cemetery entrance was redesigned with the wrought iron gate bearing five crosses that you see at the entrance to all German military cemeteries in France, trees and bushes planted, the mass graves edged individually with the stone surround you can see in the photo above. 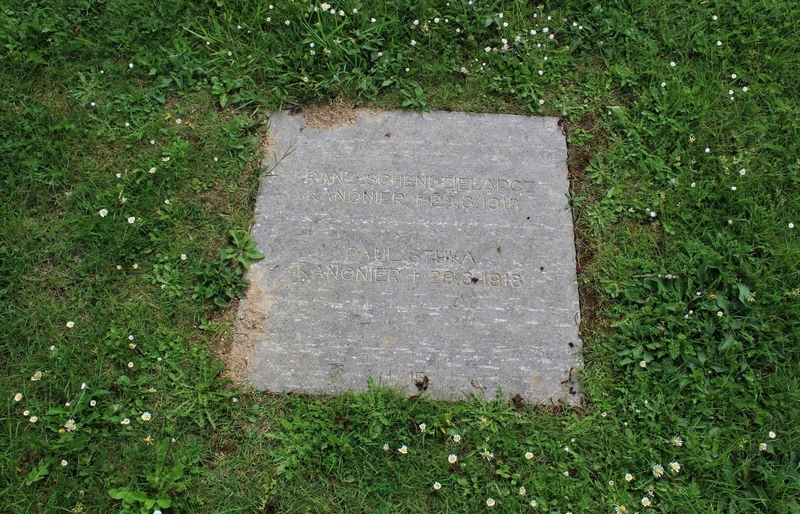 I believe there was a large wooden cross in the centre of the cemetery at the time, but as the 1930s progressed, still no decision had been made on the question of how to permanently mark the individual graves. 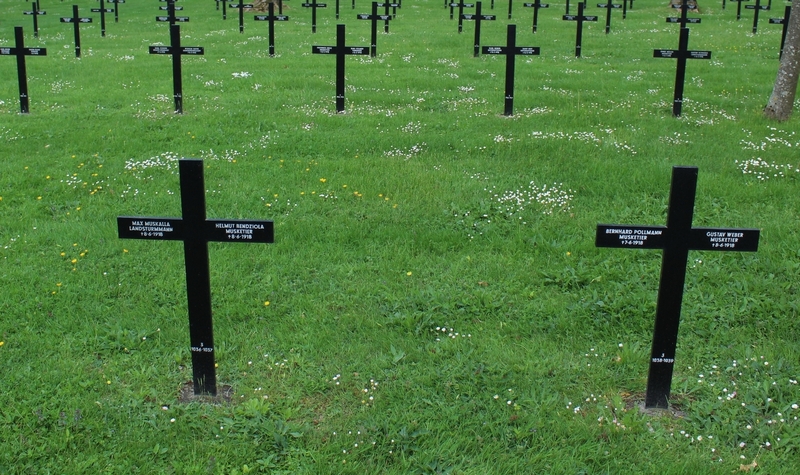 And then the Second World War halted all work on overseas German cemeteries for more than twenty five years. 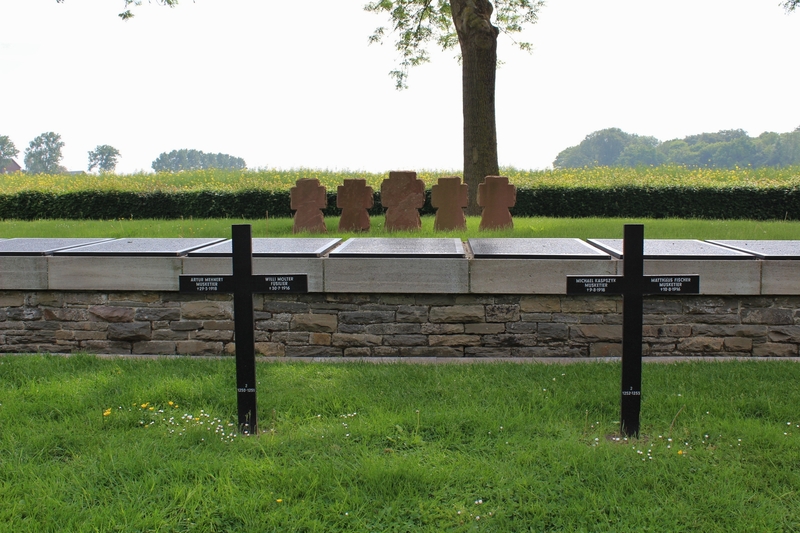 I should say at this point that the individual graves at Fricourt were at some time marked with individual temporary wooden grave markers of some sort; when these markers were installed I am unsure, the choices being in the 20s, 30s or post-Second World War. 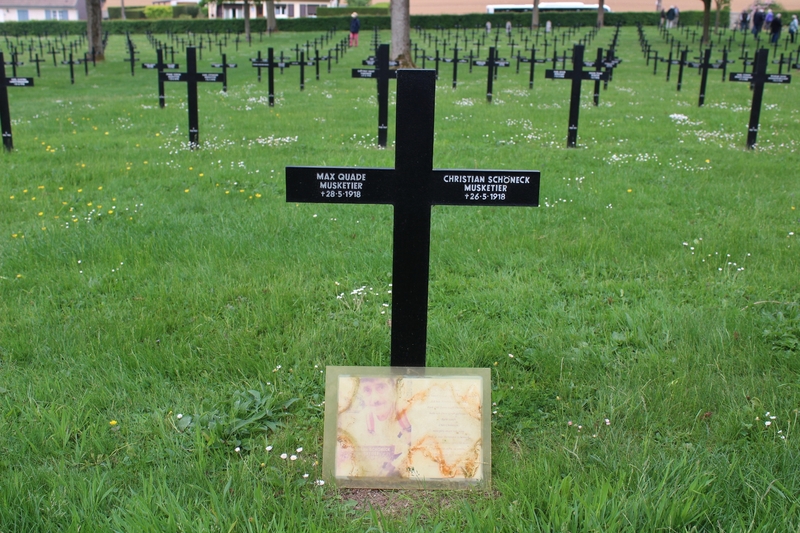 It wasn’t until July 1966 that the Franco-German war grave agreement allowed further work to be carried out at Fricourt, and it was 1977 before these temporary markers began to be replaced by the metal crosses you see today. 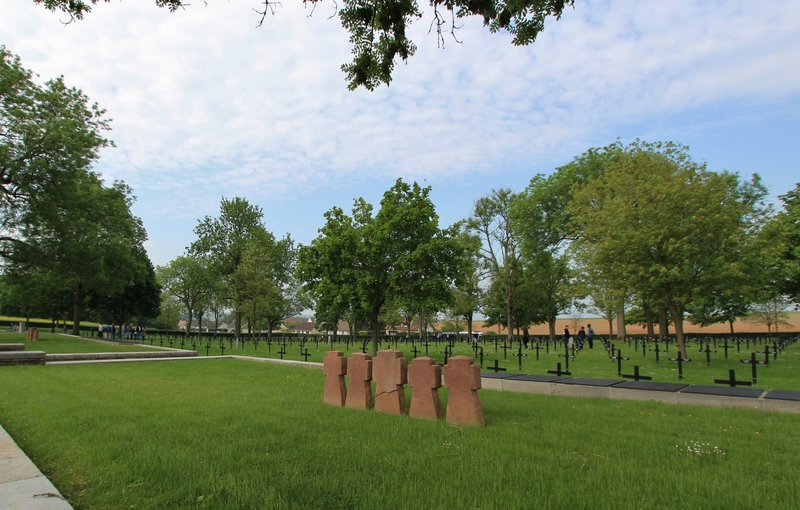 Which rules out the years after the Second World War, so presumably the wooden grave markers were all placed in position much earlier, which suggests that they had been there since the burials were first made. All supposition, however, until confirmed or otherwise. 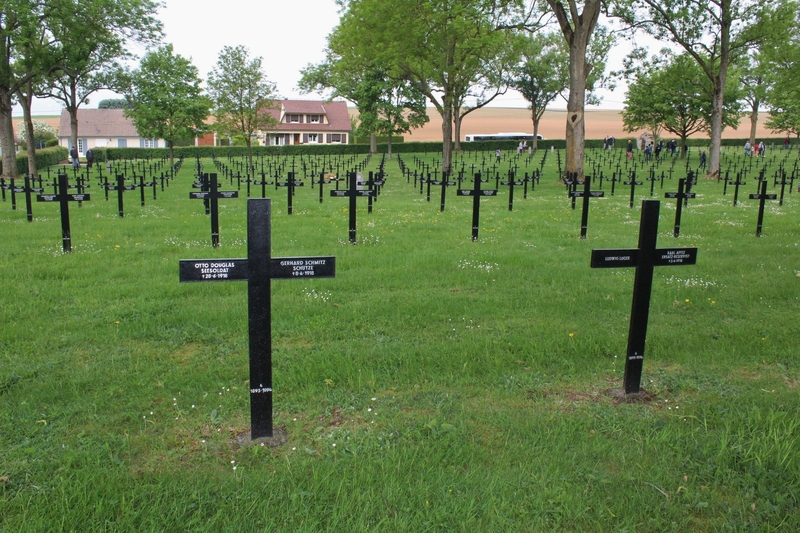 The reason, by the way, that most of the post-1970s metal crosses have four names on them is purely a financial one; the Volksbund, unlike similar organisations from other countries, is a charity, and one cross costs far less than four. On arrival we find this. 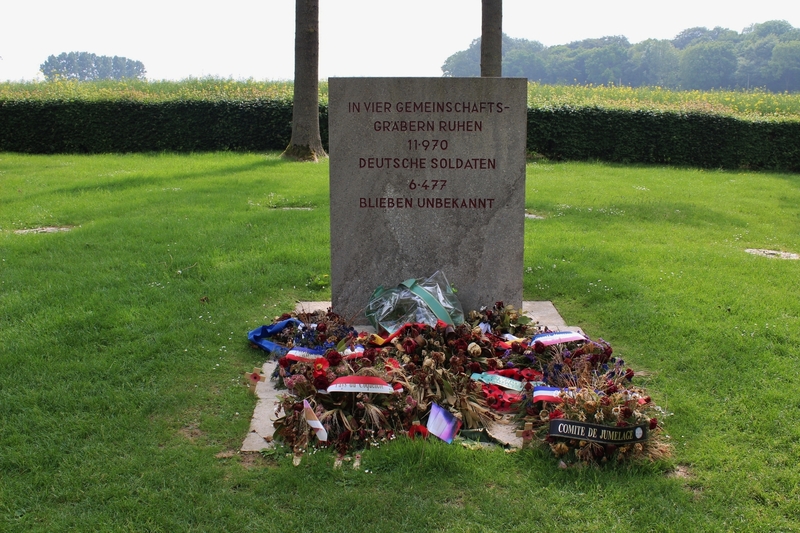 By this time I had an inkling that there was more to this grave than a home-made memorial featuring a garish pink ‘100’ on a base edged with the German national colours. And I was right. 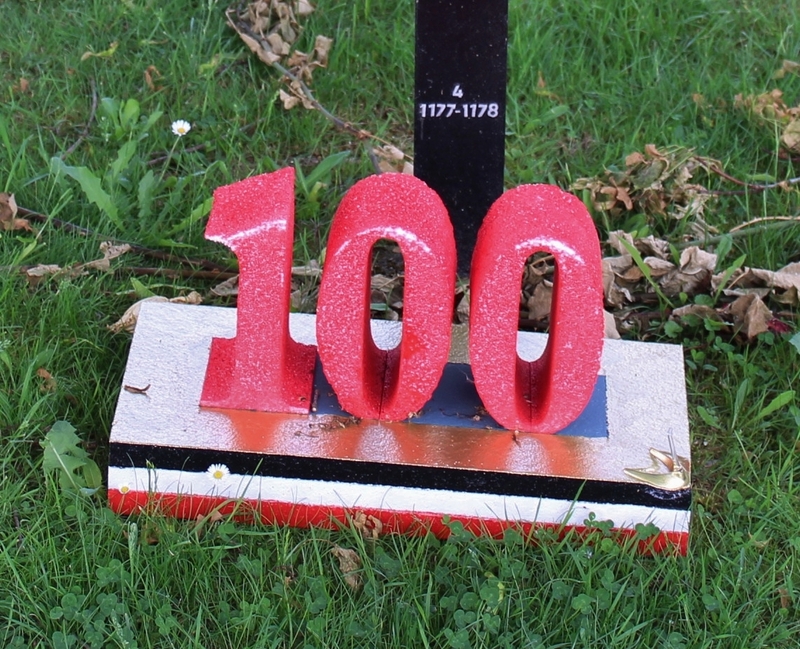 The clue is the little plastic stand fixed to the base, which would once, I suggest, before some young oik nicked it, have had a little red Fokker triplane attached to it. 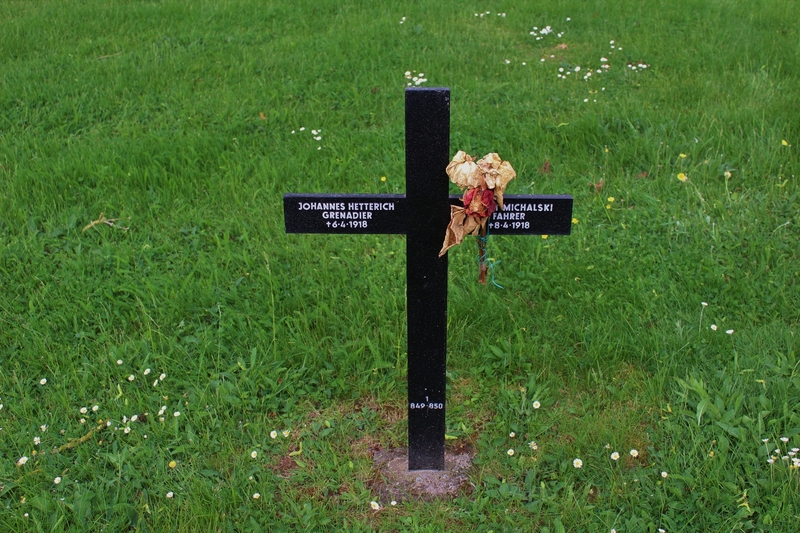 Because for a number of years in the 1920s this was the burial place of Manfred von Richtofen, the Red Baron himself, before his body was moved back to Germany by his youngest brother, Bolko, in 1925; he had originally been buried on 22nd April 1918, the day after his death, in the cemetery at the village of Bertangles near Amiens (inset bottom), before being reinterred here at Fricourt in the early 1920s, and would be moved a third time, and receive a fourth burial, in 1975. 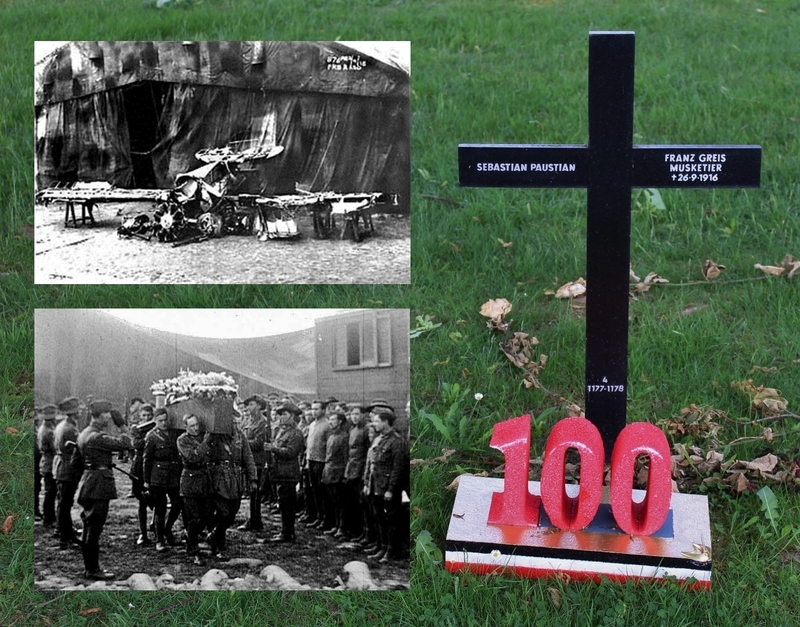 Top inset shows the remains of his Fokker Dr.1 on display on the day of his funeral. 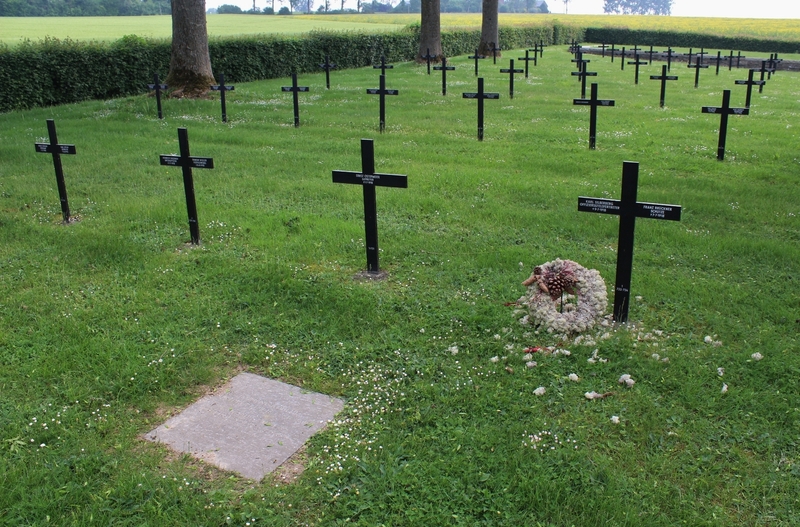 Casualties from early June 1918. 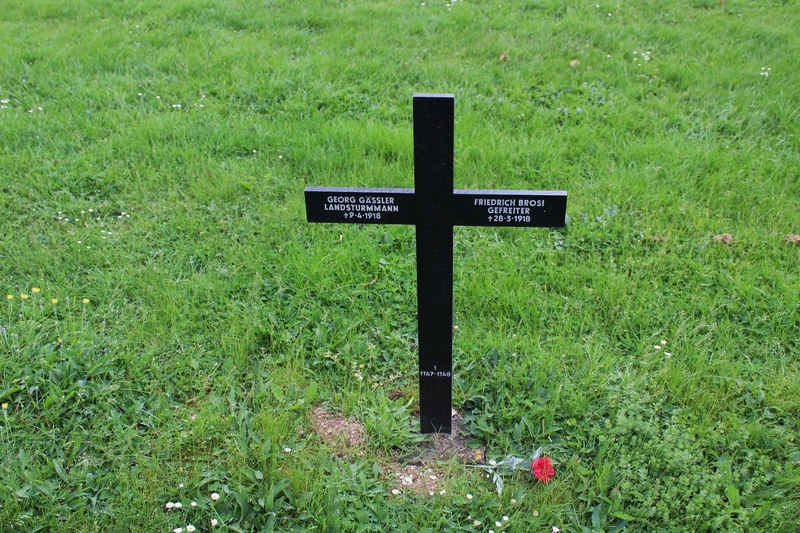 …but Musketier Christian Schöneck, killed in May 1918, is not forgotten. 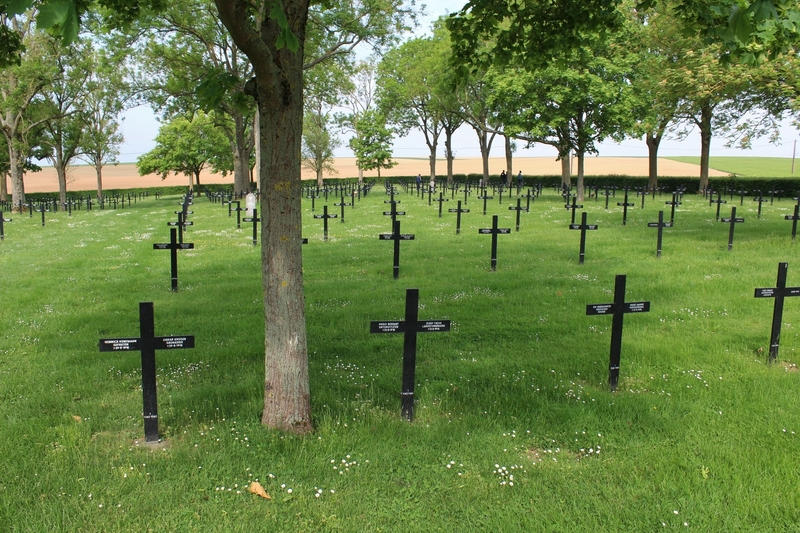 The Germas lost at least 450,000 men during the five months of the Battle of the Somme, maybe many, many, more. 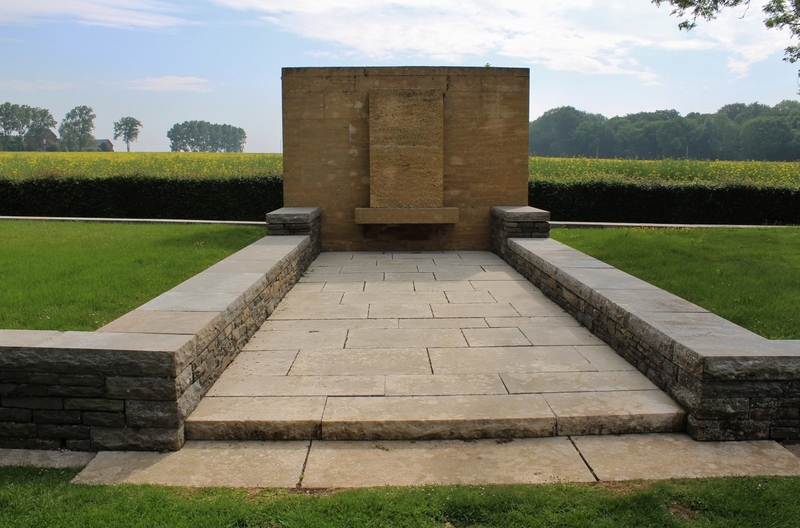 So, as we count down the days towards the centenary of Armistice Day, spare a thought for the men on the other side of No Man’s Land too. 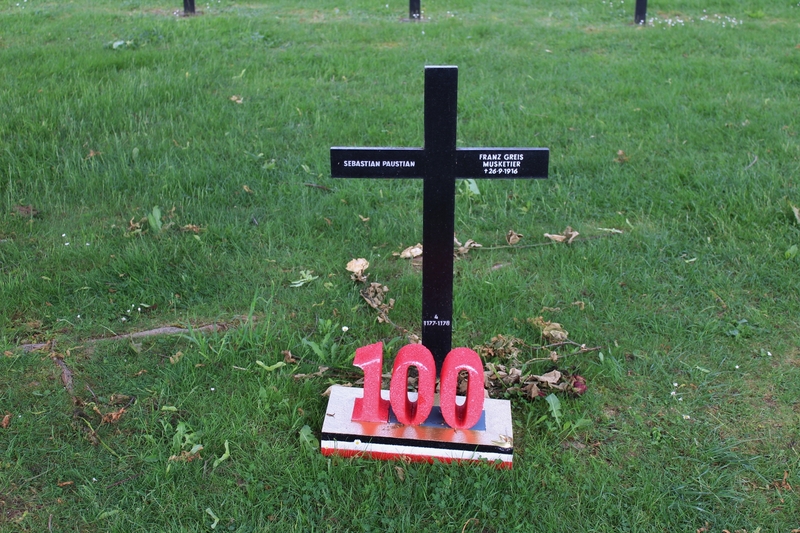 This entry was posted in German Military Cemeteries, The Somme. Bookmark the permalink. 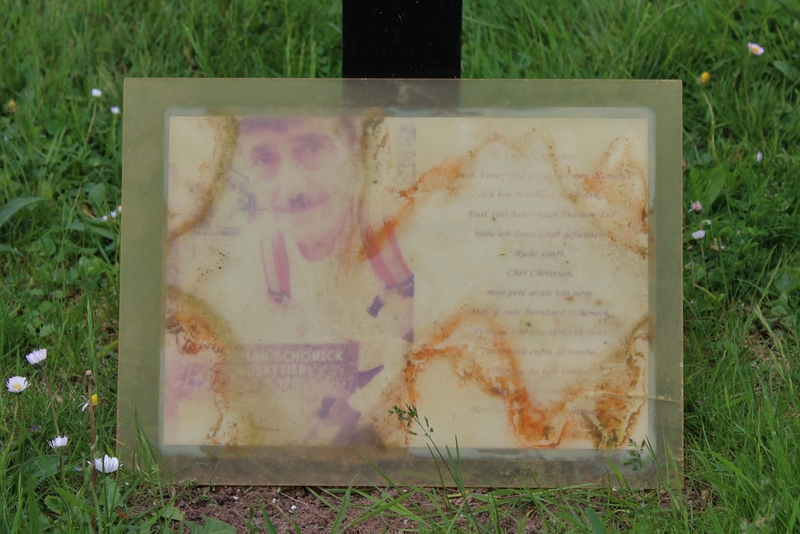 To see the single rose or the weathered photograph of Musketier Christian Schöneck – so poignant and very moving memories for the families of all who lost their lives. As we approach the centenary of Armistice Day it is indeed a time for Remembrance for all who served. It seemed appropriate to remind us all, if we needed reminding, of that fact. I have now, by the way, put the information you sent me about Captain Charlton at Riqueval to good use. Thanks again. Once again such an excellent read. Much appreciated. Cheers John. Glad you liked this one.